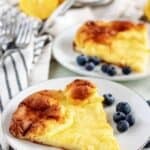 A Dutch Baby Pancake is a light and fluffy baked pancake. It has a “custard-like” texture and comes together in less than an hour. You’re sure to love it! Our Dutch baby pancake has been on the blog for awhile now. In fact, it’s been out there since April of 2016. While I don’t feel the post needs that much updating, it sure needed new photos. If you didn’t know what a Dutch baby pancake was, then I hope my description helped answer a few of your questions. Oh, I also included some tips below, in addition to the other slight changes. Now, let’s get cooking! Begin by, preheating your oven to 400 degrees F. Then, place butter in a large baking dish or ten (10) inch cast iron pan. After that, put the dish in the oven just long enough for the butter to melt. Once the butter melts, remove the dish from the oven. 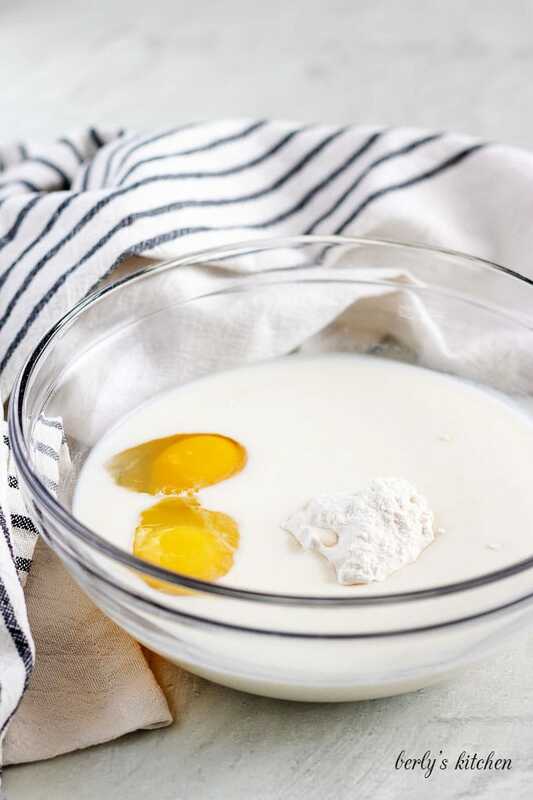 Using a mixer or mixing bowl and whisk, combine the milk, eggs, vanilla, flour, and sugar. Blend everything into a smooth, creamy pancake batter. Afterward, carefully pour the batter into the pan, over the melted butter, and return the pan to the oven. At this point, it’s time to bake the Dutch Baby for 20-30 minutes. As you will notice, the edges will puff up first and be taller and darker than the middle. The center of the pancake will puff up toward the end of the 30 minutes and deflate after it cools a bit. When the center is set, remove the pan from the oven. 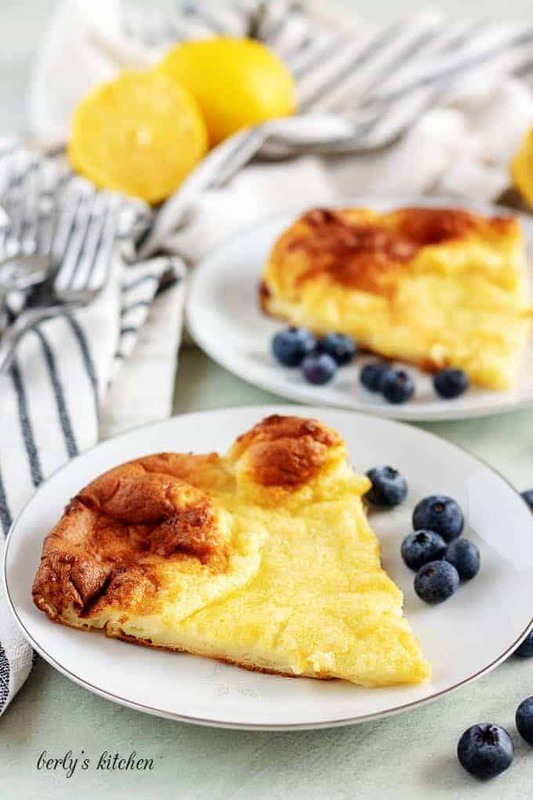 You can top the Dutch Baby pancake with a touch of fresh lemon juice, powdered sugar, fresh fruit, maple syrup, or any topping you desire. Cut it into four (4) equal portion sizes and serve immediately. 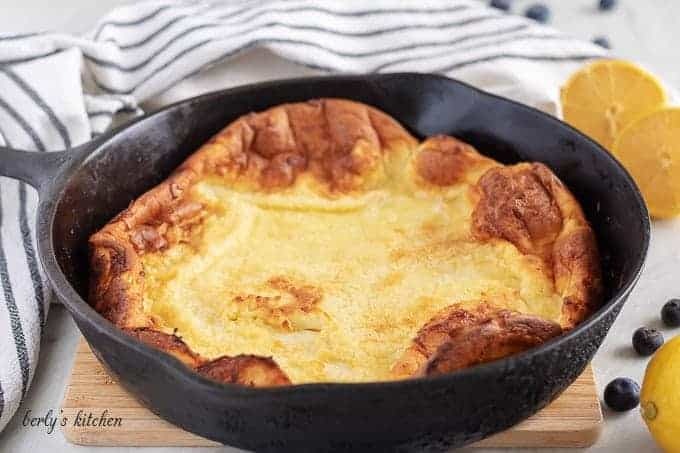 Can you make a Dutch baby pancake without a cast iron skillet? Absolutely, people have been making this dish for a long time, using all kinds of baking dishes. Cake pans, casserole dishes, and other oven-safe pans are acceptable substitutions for a cast iron skillet. Just be sure to follow the instructions and grab a dish that is of a similar size. Just because we use sweet toppings doesn’t mean you can’t have a savory Dutch baby pancake. Trying using crumbled bacon (cooked) and shredded cheese as topping. 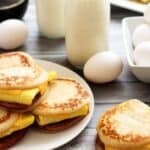 Have an egg allergy? Considering making flax seed, “eggs,” to replace the real ones in the recipe. Mix one (1) tablespoon of ground flax seed with three (3) tablespoons of water, per egg. Let the mixture sit for ten (10) to fifteen (15) minutes to firm up before using it as an egg replacement. 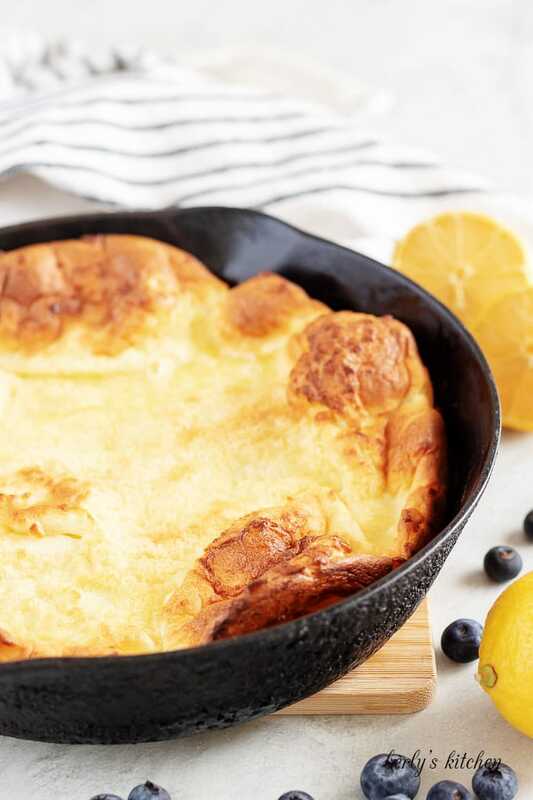 If you like this Dutch baby pancake recipe, please leave us a comment and rate the recipe card. You can also find us on Facebook, Pinterest, Twitter and Instagram searching for Berly’s Kitchen! 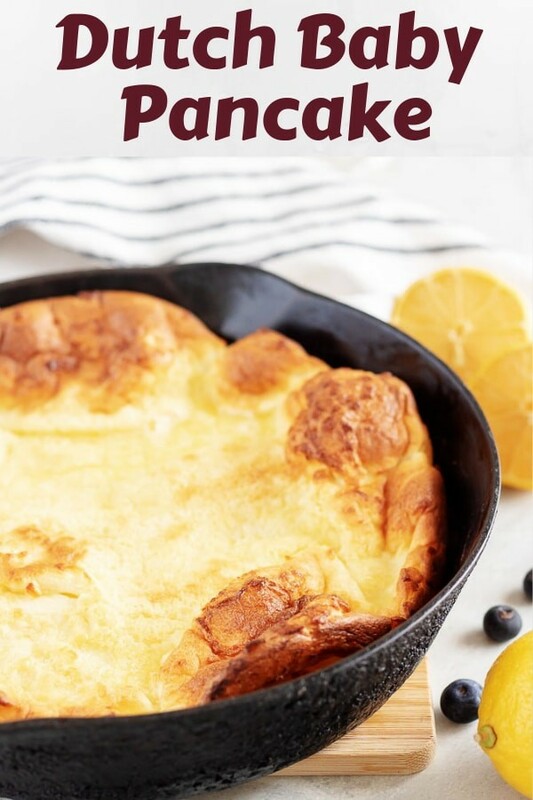 A Dutch Baby Pancake is a light and fluffy baked pancake. It has a "custard-like" texture and comes together in less than an hour. You're sure to love it! Preheat oven to 400 degrees F and place the butter into a ten (10) inch cast iron skillet. Place dish in oven and allow butter to melt but not brown. While butter is melting, place milk, eggs, vanilla, flour, and granulated sugar in the bowl of a stand mixer or blender. Combine until smooth. 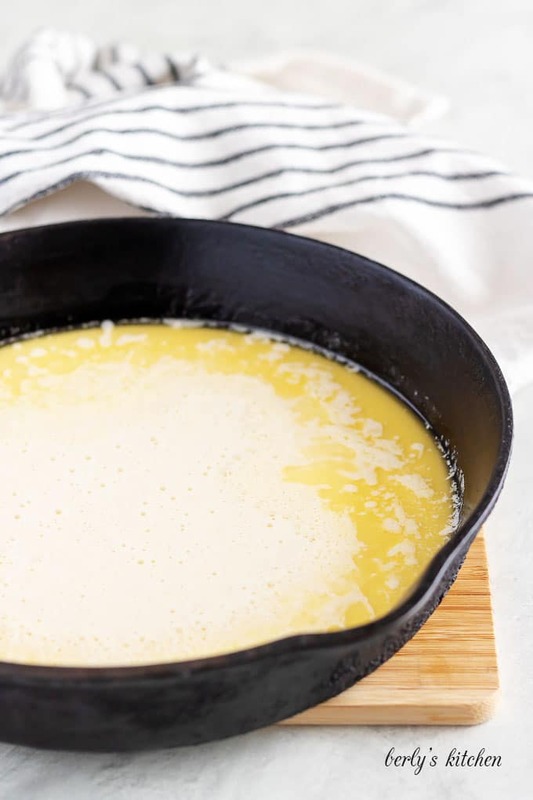 After butter has melted, remove the dish from the oven and carefully pour the batter into the dish over the butter. Place the dish back in the oven for 20-30 minutes and cook until the center of the pancake is set. Remove from oven and spritz with fresh-squeezed lemon juice, add any additional toppings, and serve immediately. The calories listed are an approximation based on the ingredients and a serving size of one-fourth (1/4th) the total pancake, (when cut into four (4) equal sized portions). Furthermore the calorie count does not include any garnishments seen the photos. Actual calories will vary. The pancake can be stored in your fridge, in a sealed container, for up to three (3) days. Whoooa! That looks amazing. I need to make this for breakfast or brunch soon. This looks absolutely delicious – I’m definitely trying it out for my next brunch! I remember having these when growing up. They were so light and delicious! Looks like a recipe I’ll have to try. I’m a new baker and still learning the art of baking. Definitely bookmarking your site for more recipes! 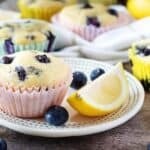 This is so easy and yummy! And so versatile, you can make countless variations of it. Our first alternative would be using freshly ground Chios Mastic instead of vanilla, omitting the lemon. Hi, Mirella and Panos! Hope all is well in Athens. 🙂 Thank you so much for commenting, and Kim is fine. Just curious, what is Chios Mastic? I’ve never heard of it? Have a great week! Hi Kim! 🙂 Mastic is a unique resin produced only in the island of Chios, in the Aegean and is used in countless dessert recipes in Greece, the Balkans, Minor Asia, the Middle East and North Africa. It’s flavor.aroma is similar to the smell of a pine tree, only milder and sweeter. It’s usually ground with sugar in a mortar and added instead of vanilla in custards and syrup-drenched cakes (like samali). We love adding it in creme brulee or rice puddings.